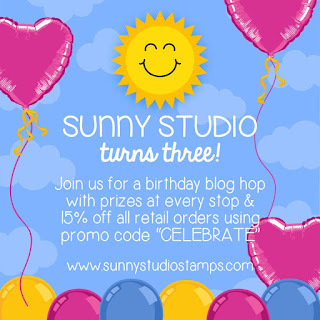 Hi friends, today I'm here to help celebrate the 3rd Birthday of Sunny Studio Stamps. I'm so super proud of Mendi and so honoured to still be on her team after all this time using her amazing products. Every release just gets better and better and I love working with these stamps so much! 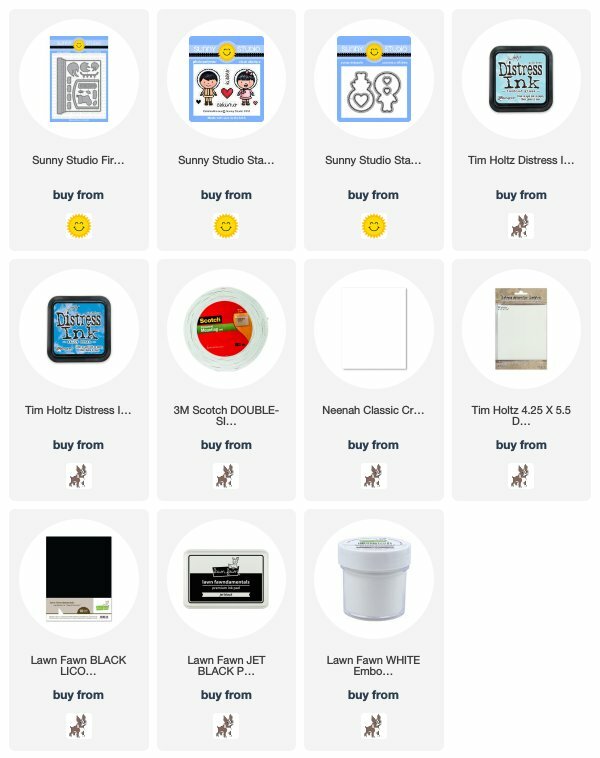 Today there are 14 designers hopping along using some of the brand new products that have just been released. Make sure you hop along, leave comments and get inspired by all the different projects. Eloise Blue - you are here! There is a coupon code for 15% off. Use code "CELEBRATE" for the discount. Also, there is a giveaway. Each of us are giving away a $25 gift certificate to the store so make sure you comment and we will each be choosing a different winner. Good luck! Make sure you leave a comment by the 1st of October, but 11:59PM PST time. Winners will be announced on the Sunny Studio Stamps Blog on Friday the 5th of October. Before I start on my card today, I have two videos to share with you today! First up, I have a video showcasing all the brand new products that have just been released. If you enjoy close up looks at releases, this video is for you. It's linked below. Now onto the card I made for today. 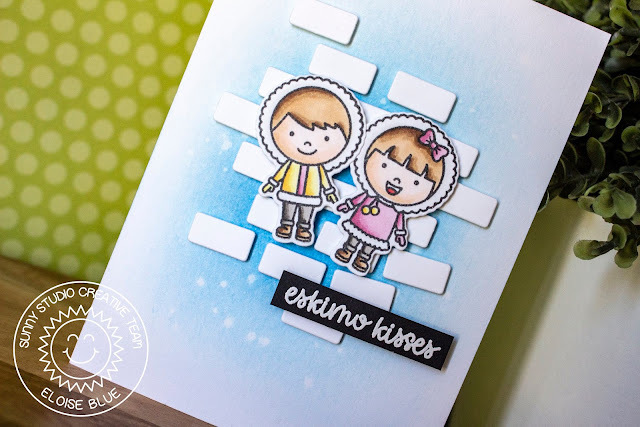 I used the Eskimo Kisses stamp set for todays project. As well as the Fireplace Dies from a previous release for the little 'brick' die cuts. To begin my card today I stamped out my images from Eskimo Kisses and coloured them in with Copic Markers. I die cut them out and set them off to the side. While I had my die cutting machine out I used the bricks dies from the Fireplace Die Set and cut them out a few times from some white cardstock. Next up I took a piece of watercolour cardstock and ink blended some Tumbled Glass and Salty Ocean Distress Ink into the centre. I then flicked on some water and dried it with a heat tool. I then added foam tape all along the backs of the bricks and adhered them randomly on the background. I added more foam to the images and popped them up in the centre too. For my sentiment I used the 'Eskimo Kisses' sentiment as well from the same set and white heat embossed it onto a strip of black cardstock. I popped that up on more foam tape and my card was complete. Thanks so much for stopping by today, I hope you enjoyed, got inspired and are enjoying seeing all the inspiration as much as I am. The video is linked below for my project, if you would like to watch. The next person on the hop is the amazing Laura Bassen, she's going to have a real treat I'm sure. Love the adorable Eskimos and your coloring. I love all of the new and interesting ideas! using the bricks to mimic an igloo BG. How cute. This is just such a fun release. So cute, I love all of your cards and videos! Great card! Love the Eskimo Kisses! And the bricks! How clever!! Beautiful card. The Eskimo kisses stamp set is very cute. So cute, Eloise! Love the little bricks. Using the fireplace bricks for ice bricks is a GREAT idea! The card makes me want to cuddle up with my hubby! Your background color / blending is just perfect for the card! Thank you! Beautiful colors in the background. The characters are so sweet. So adorable and such a good idea to use the fireplace dies! That's such a clever card Ella..love the background and the bricks to suggest their igloo was brilliant! Great card - love the background and how you colored the images. Such a cute card Eloise :). I like the background you created. Adorable card!! Such a creative and different way to use the fireplace die for the ice blocks of their igloo! Enjoyed your video. The little characters on the Eskimo Kisses stamp set are super sweet! What a cute pair! I love this sweet sentiment! Thanks for the technique using "Eskimo Kisses", I'm going to try it! I enjoyed your video of all the products, especially the alpaca stamps! Your card is so cute. Thank you for sharing your technique! I love Eskimo Kisses! Such a great video! Love your card Eloise, those eskimos are super adorable. Great job. Eskimo kisses is so sweet. I also love the owls and holiday trimmings. Such fun, and Happy Birthday Sunny Studio. Wishing you continued success and thanks for bringing us such great products. The releases really do keep getting better!!! I love this release sooooo much!!! Love those adorable eskimo kids - super sweet card! luv the ice blocks in the background! Very cute cards. Thank you for the video tutorial. Thank you for such a fun video! I think how you arranged the different blocks on the card look perfect! I really loved watching how you colored your adorable little eskimos children too! cute Eskimos and I like the background. That's a great background to highlight these little cuties. Since I'm incredibly lazy, I don't often want to do full scene cards, so I appreciate seeing how one can use small characters without them getting lost on a card front. Thank you for sharing with us! So cute! Love your idea for the ice blocks, and the Eskimos are adorable! Such a fun Winter card! My favorite new item is the Tag Die. Very Useful! This igloo is filled the love and warmth of these two cute children! Sunny Studio Stamps have the most darling people, and they look right at home in this scene you've created for them, Ella! So, so cute! I love this new release!!! Adorable card! Fantastic clean design and I just love the ice blocks. I just adore this release and your project is awesome! Super cute with the ice blocks in the background. Your coloring was very nice. I just love this new release!! Eloise this is such a super cute card! Love the wintry look and the blocks of ice! Super cute coloring! Such a cute and clever card! Love it! I enjoyed both of your videos and your card is absolutely adorable. Those kiddos have the cutest faces tfs. SQUEAL!! LOVING all of the AMAZING Inspiration!! I LOVE your Projects!! They just make me SMILE!! ;) THANKS for sharing and have a FABULOUS WEEKEND!! What a sweet card! Love 💕 it! thanks for the inspiration and the videos! Have a wonderful day! Oh, I love your design, so clever! The card is as adorable as the stamp set itself! Such a cute card...love the bricks of snow behind these cuties. Hi Ella :) Love your background and your little folks! 100% pure sweetness :) Thanks for sharing! The background on your Eskimo Kisses card is SO creative! I love that beautiful light blue blend of color and those adorable snow bricks! Super cute! Really cute card. Love the way you did the background! Love the Eskimo kisses card! Thanks for sharing! I love the "ice bricks" behind the little cutie Eskimos kids, so adorable. Thanks for the inspiration, I love it! such great colors used in the papers. Love all the stamp sets. 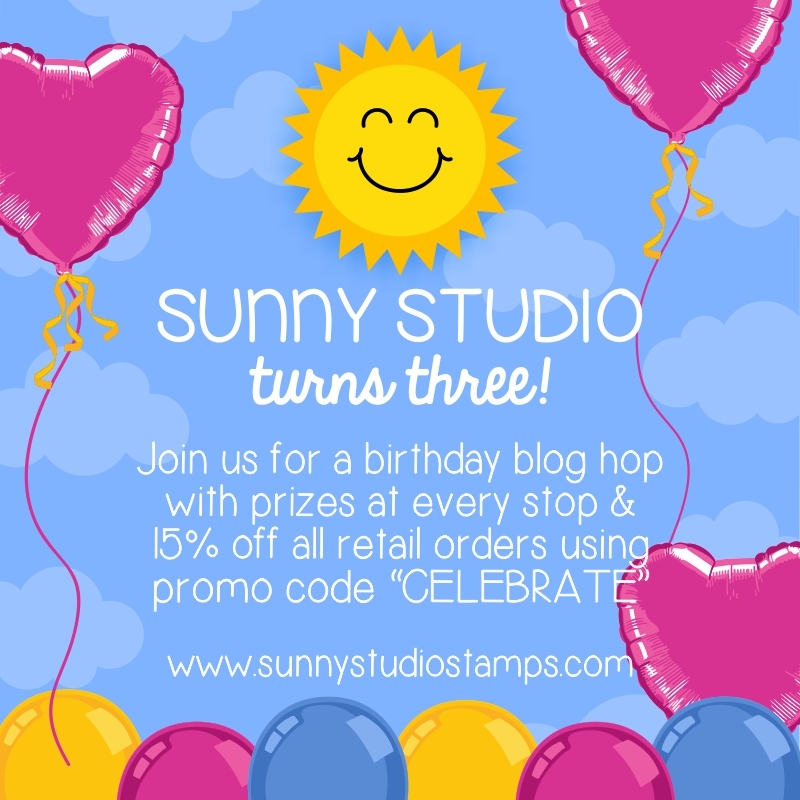 Happy third birthday Sunny Studio! Adorable card. Thank you for sharing. What a cute and clever card - I love the shaded background and then those ice bricks make such a cute backdrop for these adorable eskimos! I think this is absolutely marvelous!! Very sweet card. I love the background and the sentiment is perfect. Love your adorable card. Great design. What a clever way to create their snow bricks! Very sweet. This is such a cute group of stamps, and your eskimos are adorable! Your card is so cute! I love the sweet little Eskimos and the inked background with the bricks. Very clever. Thanks for the video showing all of the new products. Adorable Eskimos! Love the bricks for the background! Such a lovely card with the adorable Eskimos! Adorable card! Love how those bricks give the illusion of an igloo - very creative! Very clever idea to use the bricks for the background. Cute card! Cute card, love how you created the background! Thank you for sharing your talent! The background is great! Fabulous background! Super cute card! Very cute card! I love how you used those bricks to create a background! This is such a cute card Eloise. Who could resist those little eskimos? So sweet. Happy Birthday!!! Just darling. Thanks for the inspiration!! !